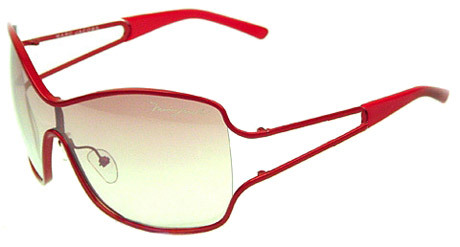 Natalie Portman, as poker player Leslie, wears a pair of raspberry red Marc Jacobs 050 sunglasses in the movie My Blueberry Nights. This colorful pair of shades, with a white Marc Jacobs signature on the left lens, fits the style of the movie and Portman's outfit very nicely. The glasses can best be seen when Natalie Portman's character drives to Las Vegas in her black Jaguar, together with Elizabeth (Norah Jones).